Because everyone has a different set of hands, it can be hard to label any one accordion as being the best. As such, it only seems suitable to point you in the right direction of several great accordions so that you may have the final say based on your own particular needs. The following review will lay out the three best accordions on the market based on a criteria of versatility, ease of use, aesthetic appeal and their sound quality. We’ll also help you pick out the best accordion for you by helping you understand which model best fits your own preferences. After all, you’ll never get to learn to play in the first place if you spend all your time shopping around. All of the below accordions are great, there’s no doubt about that. However, as opposed to simply picking one at random, it certainly helps to know just what it is you’re looking for in an accordion and which of the below three models will cater to your needs. For example, if you simply want something that works in all situations, whether you’re playing on stage or teaching your son how to get into the instrument, the first model we covered is your best choice. Despite being slightly small in stature, it still carries with it a great sound that the majority of similar products just can’t match. If; however, the accordion you plan on buying is going to be used solely by a beginner, the second and third models we covered are likely more suitable, as they’re even smaller in size. Which one you pick might come down to the type of look you’re after in your next model. While the second model comes with a more traditional look, the third sets itself apart from all others through its sleek design that pairs many modern physical features with a more traditional feel. It’s all up to you. A diatonic accordion, the Hohner Panther offers its users a simple-yet-outstanding accordion experience. 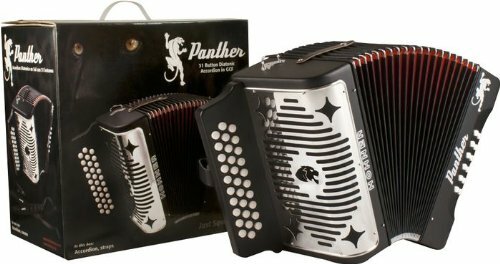 Now, if you have yet to use an accordion, the Hohner Panther might just seem like any other product of its type upon first looking at it. After doing some further research; however, you’ll realize that this couldn’t be further from the truth. In fact, I’d go so far as to call the Hohner Panther the most versatile according of the bunch, no matter your age, playing experience or skill level. This is because it comes in a more middle-of-the-road format, ensuring that the instrument isn’t too hard to play, though that it will feel far from basic when in the hands of experienced musicians. It is this feature and this feature alone that sets it apart from all similar products on the market. Because of this characteristic, there’s nobody in particular that I couldn’t recommend this product to, being that it works equally well for everyone. Whether you’re just beginning to learn and find yourself terrorising your family with flat notes, or whether you’re performing on stage for money with other professionals, the Hohner Panther will get the job done. Of course, this is a huge advantage. However, as with any musical instrument, this accordion’s ease of use isn’t the only important factor to consider. There comes the question: does it sound any good? As it turns out; yes! It sounds great. Although this may be subjective to some degree or another, it helps to look at reviews laid forth by previous users of the accordion in question. This is because the manufacturer can’t simply put “sounds great” in the product’s specs. 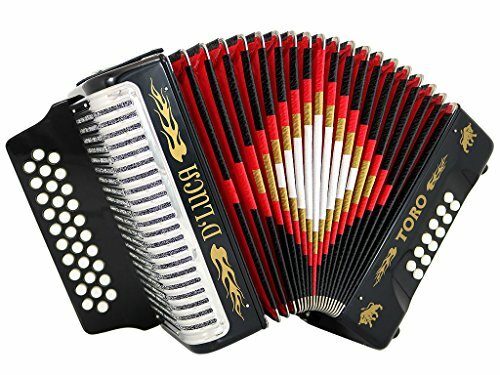 However, upon looking at reviews on the Hohner Panther’s official Amazon listing (which can be found by clicking its name above), there’s no doubt as to whether or not the accordion sounds great. Once again, despite being suitable for beginners, the Hohner Panther will produce a sound which is worthy of any situation, even those of the most professional variety. Through every metric of quality by which you could even begin to measure an accordion, the Hohner Panther always holds up great. And, because it can be suitable for such a wide variety of folks, it can be considered as being one of the safer purchases among products of its type, being that you’re unlikely to find yourself incompatible with the accordion in any way. The D’Luca, while not exactly kids size, is certainly a little smaller than the above accordion we just covered. As such, it may be more suitable for those of a younger age. You’ll find that smaller hands have no issues in terms of being able to work this accordion to its fullest potential. Not only does this make it easier to play at first, it may keep younger musicians from getting discouraged and moving onto a new instrument. However, just because it’s suitable for younger musicians doesn’t mean that it’s not suitable for anyone else. Because the accordion is smaller, you’ll be able to better use it if you haven’t yet built up the hand dexterity required to play larger models. Much like the bass is to the guitar, you won’t have to use as much hand strength to get this according working. As such, no matter what age you are, you’ll find the D’Luca to be an excellent beginner’s tool. However, unlike actual kids size accordions (the D’Luca is still much too large to fit into the category), this particular model will continue to be useful even as you get better at playing. This ensures that you won’t find yourself running into the need for a large purchase once you get the hang of things. But what if you’ve been playing the accordion for quite some time now? What if you don’t need one that’s easy to play? If this is the case, you may still find the D’Luca to be worth your while. Why? Because of the quality of its sound. Now, I’m not going to say it has the best sound quality out there. In fact, if sound is all you’re after, I’d recommend the first product we covered. However, the quality of its sound is easily the best on the market when you compare it to its overall price. As such, if sound and frugality or both important to you, you simply can’t beat the D’Luca. As you can see, this particular accordion is suitable for a wide range of people, giving it a well-deserved spot on this list. Whether you’re just starting out or would like a great bang for your buck, it doesn’t get a whole lot better than the D’Luca. If you take a look at this accordion’s dimensions, you’ll notice that it carries with it a lower overall volume (referring to mass; not sound). This makes it rather easy to play, though through a different means than the above two accordions. Think of this one as a fifty-foot sprint rather than a sixty-foot sprint. While it may not account for a low skill level, it’s certainly less physically demanding. As such, if you find your hands getting tired easily while playing most accordions, this particular product may begin to mitigate this effect to some degree or another. However, it still looks just like any other accordion in terms of its overall dimensions, so don’t feel as if it doesn’t fit in with traditional models, as this couldn’t be further from the truth. 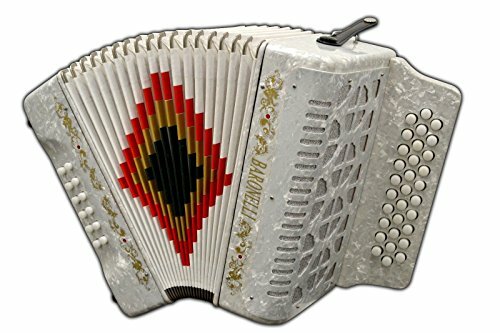 Outside of its (slightly) offbeat dimensions, it also carries with it a sleek look which is sure to set you apart from all the other accordion players you hang out with. In contrast to most accordions which use a whole lot of black in their make, the Baronelli Key of SOL is almost all white. In terms of its overall look, it doesn’t get a whole lot better, though this may be subjective to some degree or another. All of the above accordions are great, there’s no doubt about that. However, as opposed to simply picking one at random, it certainly helps to know just what it is you’re looking for in an accordion and which of the above three models will cater to your needs. For example, if you simply want something that works in all situations, whether you’re playing on stage or teaching your son how to get into the instrument, the first model we covered is your best choice. Despite being slightly small in stature, it still carries with it a great sound that the majority of similar products just can’t match. Perhaps none of the above seem to have just what you’re looking for? No problem – there are a wide variety of these instruments being sold on the market from which you can choose. However, it helps to know just what to look for in your next purchase. To ensure you come out with the best possible product for your needs, try keeping some of the below factors in mind while shopping. Even if you’ve never played an accordion up until now, finding the perfect model doesn’t have to be a complicated experience. How long are your fingers? Unfortunately, even if I knew how long your fingers are, I can’t give you a magic number in terms of which accordion dimensions are more suited toward them. However, it goes without saying that a smaller accordion is more suited toward smaller fingers, while the opposite is true of larger accordions. After looking at a product’s dimensions and deciding that it might just work for you, take a look at what past customers have to say about it. If enough people have used any given model in the past, you’ll likely find that others with short or long fingers have chimed in with a review at some point or another. While any fingers will be compatible with any accordion, it’s always worth searching for something that’s easy to play. Where does your current skill level lie? Once again, the answer to this question will determine whether you’re better off with a larger accordion or a smaller one. Generally speaking, the more advanced you are, the bigger you can go. This is due to the fact that smaller accordions’ buttons will be placed close together, as well as the fact that these same accordions will have you moving around less. There are several different types of accordions available at your disposal, each with their own pros and cons. Do you know which type you need? Diatonic – Diatonic accordions are known for being most suitable when used in casual situations. Not only do they generally come at a more agreeable price, they tend to be easier to use and produce a great, versatile sound. Chromatic – Chromatic accordions are best suited toward advanced players. While they tend to be more complex, they may increase your abilities if you’ve already mastered the diatonic accordion. This is due to their large amount of buttons. Often, there will be two (or even three) buttons for each and every note, giving you more options in terms of finger positions. Piano – As its name clearly suggests, the piano accordion is the accordion we’ve grown used to seeing in different forms of media which comes with a set of piano keys on one side. These tend to be large and heavy, possibly more suited toward advanced players, though players of all walks of life may appreciate what they have to offer. If you’ve seen any amount of accordions in your day, the vast majority of them most likely belong to this category. I can’t tell you which of the above types of accordion is best. It will be up to you to decide which one more suits your interests. However, by keeping in mind everything you’ve learned in the above review and buyer’s guide, you can be sure that picking out the right accordion will be a very easy process. Remember, while it’s important to consider whether or not other musicians enjoy any given accordion, it’s also important to consider whether you’ll enjoy an accordion. Keep in mind that your needs might be dramatically different from the next accordion player.